Reserved Material allows you to apply additional controls to inventory used in Activities and Service Calls. This is done to ensure material is available as needed for service calls, and that service calls can be completed without additional delays. The basic idea behind it is enabling materials to be reserved or dedicated to a specific service call in advance, so that technicians have the items they need to complete activities and service calls without delays caused by additonal parts orders and/or non-optimal sourcing. This also means that unless the reserved material requirement is met for the activity, then the service call be be rescheduled. ERP It is in the ERP where reserved materials are created and managed. When activities are created in response to service calls, this information will be communicated to the Planning & Dispatching module, where it can then be scheduled and released. Planning & Dispatching When service calls with reserved material are communicated from SAP B1, they can then be viewed, planned, and assigned there. Warehouse The warehouse is the location in which items are stored. This physical location can be a building or a car. The Reserved Material Process allows you to, if applicable, specify from which warehouse you would like to source items to be used in the course of an activity, as well as to improve oversight of the materials. Equipment Equipment is generally the primary focus of a service call, with the related activity generally involving a service or repair of this equipment. Material Material are the items or articles used in the activity to repair, service, or replace the equipment. In the Reserved Material process, these items are specified by quantity and location and assigned to the activity. Person Person is the employee/technician responsible for responding to the service call and completing the assigned activity. They will complete the checklist and enter the reserved material quantity data. You must first import the reserved materials custom rules in order to be able to create reserved materials in SAP B1. Next you will need to enable the DI_API for the UDT to ensure the table is visible. Using the newly-imported custom rules, you will now be able to designate items in SAP B1 as reserved material. After importing the custom rules in SAP B1 and creating Reserved Material, you can then update the permissions in the Admin application for the feature to operate. There, you will assign UPDATE and READ permissions to the Reserved Material business object. After upading the permission settings, service calls with reserved material can originate in SAP B1 and be released as activities in Planning & Dispatching. When completing the checkout with the customer, the technician can then input how many of the Reserved Material item were used (example: 5/10). When this is synchronized with the cloud and the ERP in the backend, the reserverd material consumption information is also communicated. Any remaining material could then be used for another activity. The creation of a Reserved Materials tab in the SAP B1 interface. The ability to right-click materials to add designate materials as reserve materials. From SAP B1, navigate to Customize > Import Rules. From Import Rules, select Upload File > UDT Handler > Import. Select the following “Reserved Material” custom rules file. When complete, you will then need to restart the computer. When you restart the computer and restart SAP B1, a Reserved Material tab will now be present, and you will be able to right-click to add reserved materials. Remove the line entry COR_CLOUD_* from this file. This ensures you will see the table in the UDT Handler. Right-click on the material record and select the Add Reserved Material option. Select the Quantity to be reserved. Now, when service calls are created that include reserved materials, they can be viewed and managed from the Reserved Material tab. Note: Reserved Material information can also be viewed from Planning & Dispatching in the Service Call Details section. Reserved Material Activities of type “Assignment” Allow checkout with left-over reserved material. If you check this box, the user can do a checkout with left-over Reserved Material. Stock Transfer Activities of type Assignment > Reserved Material In order to be able to use this, you must also have the permissions for Reserved Material. 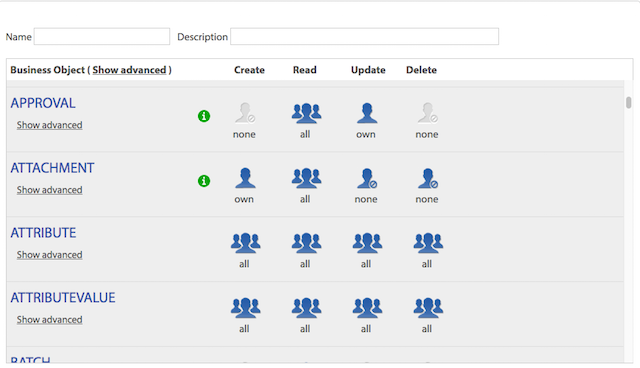 Search for the cloud user for whom you would like to assign permissions to READ and UPDATE Reserved Material. Chose the permission group to which you want to assign the permissions on Reserved Material. 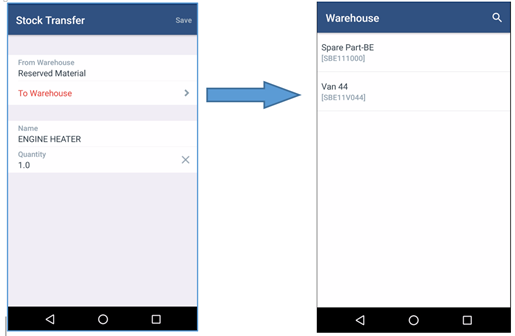 Attention: The ReservedMaterialPreShippingEnabled is only available for Android, and can only be used when operating Field Service Management with the SAP-ECC Connector. The PreShippingEnabled setting is used for “advance shipment” scenarios, such as when an assignment requires spare parts that are sold to the customer prior to an assignment. Pre-shipment reserved materials are “out of the stock” when sold and sent to a customer. CoreSystems. 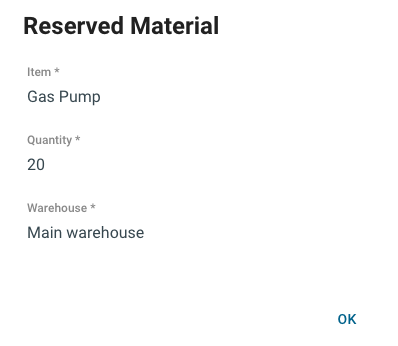 ReservedMaterial PreShippingEnabled TRUE to calculate the remaining quantity for reserved material against the “new” shipped quantity instead of the existing “reserved” quantity. 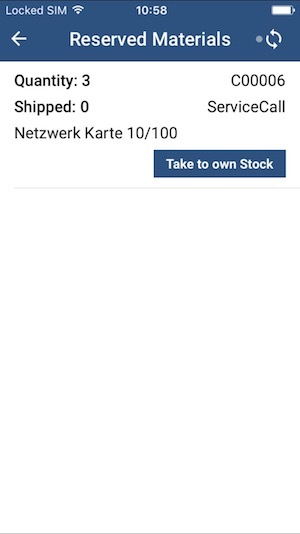 If the shipped quantity is less than the reserved quantity an alert icon is shown on the mobile apps on the home screen and the assignment detail screen. FALSE or setting is not defined to calculate the remaining quantity for reserved material against the existing “reserved” quantity. Option to alert the technican if the reserved materials that was planned to be pre-shipped as advanced shipment for a service call has not yet been sent to site. This helps to warn the technician to reschedule the site visit instead of unnecessary traveling and time inefficiencies. Service calls with reserved material will originate in SAP B1 and be released in Planning & Dispatching. From the Service Call list, right-click the service call with reserved material you would like to view and select the Show Details option. In the Reserved Material section, you will be able to view all reserved material information related to the service call and activity. From the Planning & Dispatching screen, select the service call with the reserved material you would like to release. Drag and drop the service call from the Service Call List to the Planning Board. After finding the optimal response time and personnel, select the Release Assignment option from the top row (assignments can also be released by right-clicking the assignment record). The technician will then receive an alert with the assignment details. Synchronize data to the mobile application. You will now be able to see Reserved Material in in the assignment. When picking up location, warehouse location will update from physical address to technician automobile. Later, when you complete the checklist and checkout, you will be prompted to enter the quantity of reserved material used (enabled by the Reserved Material permission). Now, when you Synchronize data from the mobile application, the remaining reserved quantity could then be reserved for another activity.